Bittersweet is hardly a word to describe one’s birthday, but for Artemio Caleda, not only did life begin on that date, so did the fight of his life. Feb. 18 marks the 92nd birthday of Caleda of Honolulu who, at age 17, was a jungle fighter in the Philippines. He’s a proud World War II veteran — but also an unrewarded one. Seventy years ago, Caleda became one of the many Filipinos stripped of the military benefits promised to them by the government for their service during the war for the U.S.
Caleda, along with more than 250,000 Filipinos, answered President Franklin D. Roosevelt's call to serve in WWII. As scouts, guerrillas, and enlisted soldiers in the Philippine Army, they were told they would get full benefits in exchange for putting their lives on the line, fighting side-by-side with the U.S. military. With President Harry S. Truman's signature, the act became law on Feb. 18, 1946. The Rescission Act came with an appropriation of $200 million to pay the Commonwealth Army of the Philippines. But in public documents released two days after his signing, Truman indicated he had some reservations in not honoring the veterans directly, writing that "the passage and approval of this legislation do not release the United States from its moral obligation to provide for the heroic Philippine veterans who sacrificed so much for the common cause during the war." Still, the law has been the roadblock for Caleda and others who have engaged in the fight to be made whole for their service ever since. But a glimmer of hope arrived for the veterans in 2009 when President Barack Obama signed the Filipino Veterans Equity Compensation Act of 2009. After years of lobbying efforts, Filipino veterans who fought in the Philippines won a one-time lump sum payment — $15,000 if they lived in the U.S.; $9,000 if they still lived in the Philippines. According to the Dept. of Veterans' Affairs' website, 42,755 claims have been made since the benefit process began — but, to date, there have been more denials than claims granted. As of December 2015, more than half of claims made by Filipino veterans have been denied, though the 18,960 claims granted have totaled more than $225 million. The VA has received more than 4,500 appeals — though the appeal rate is currently less than 30 percent — but many veterans are running out of time to see their benefits, and Roosevelt's promise, restored. According to the VA's website, appeals remain pending, on average, for 160 days. Currently, the VA lists 61 pending appeals. But Caleda, who celebrates his 92nd birthday this year, isn’t sure where he officially stands. His case involves a paperwork battle, but with a twist. While his documents show he was part of the Philippine Army under the authority of the United States Army Forces in the Philippines (USAFIP), his war status has been continually denied because it cannot be verified through the available records at the National Personnel Records Center in St. Louis, Missouri. Further complicating matters is his name under the official guerilla roster of the U.S. Army, which lists him under his alias Monitor Tambong. Other documents show both his names. This Philippine government document authenticates Artemio Caleda and his alias, Monitor Tambong, as one and the same. 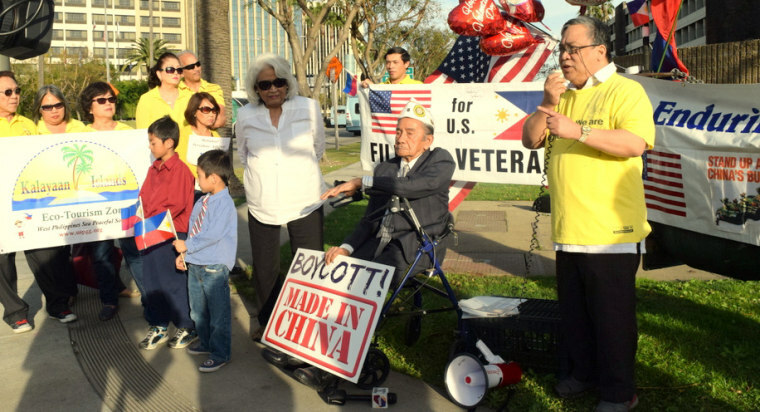 The U.S. Army has disallowed the document and says Caleda is ineligible for the equity lump sum payment awarded Filipino Veterans of WWII. The VA has declined to comment on Caleda's case. While the lump sum has eluded him and other veterans, Caleda is hoping for another bit of relief on the issue of family unification. Caleda was part of the lobbying effort that resulted in Obama’s announcement last July that he would use parole as a humanitarian technique to allow veterans to be reunited with adult sons and daughters who may be in the Philippines. The plan was for special visas to be issued to shorten the long immigration wait that have taken some Filipinos up to 20 years. But so far, there has been no guidance from the Department of Homeland Security or the State Department. Franco Arcebal, 92, a spokesman for the American Coalition for Filipino Veterans, told NBC News he met with Philippine officials accompanying Philippine President Benigno Aquino III on Sunday. Arcebal said he hoped that Aquino would urge Obama to move faster on the visa relief while meeting at this week’s U.S.-ASEAN summit in Rancho Mirage, Calif.
“It’s been seven months and there’s no application yet,” Arcebal said. Despite the visa matter, Arcebal is one of the lucky ones who has received the $15,000 lump sum payment from the 2009 legislation. He says he used it for living expenses and to help his children. But he paid a price for the lump sum. Arcebal said he was a guerrilla fighter in Northern Luzon of the Philippines, captured by the Japanese. Arcebal said he escaped and eventually found his way to be part of the forces that joined General Douglas MacArthur’s return in Leyte. But even though his benefits have been restored as payment for his service, he continues to advocate for his fellow Filipino vets who are still alive and still have the will to fight the effects of the Rescission Act, decades after its signing. To him, there’s no question: the remaining veterans who are seeking appeals deserve their pay.